A Yokohama diner is waiting to greet overseas fans visiting Japan's second-largest city for this year's Rugby World Cup with a range of beers from participating nations. Takeshi and Kaori Kato threw open the doors to 7 Oath's, in the Kannai district, for the first time in December 2017, after learning the port city would host some matches, including the final. Influenced by his father, who was on the coaching staff at Yokohama Rugby School, Takeshi enjoyed playing the game as a forward until he graduated from high school, and remains a big fan of the sport. "I just wanted to create a place for rugby fans to get together and enjoy watching games," said Takeshi, called "head coach" by his regulars. His wife Kaori cooks Western-style food such as hamburgers, meatball pasta and New Zealand grass-fed beef steak. Some 15 beers imported from Australia, New Zealand, Fiji and other countries are available. 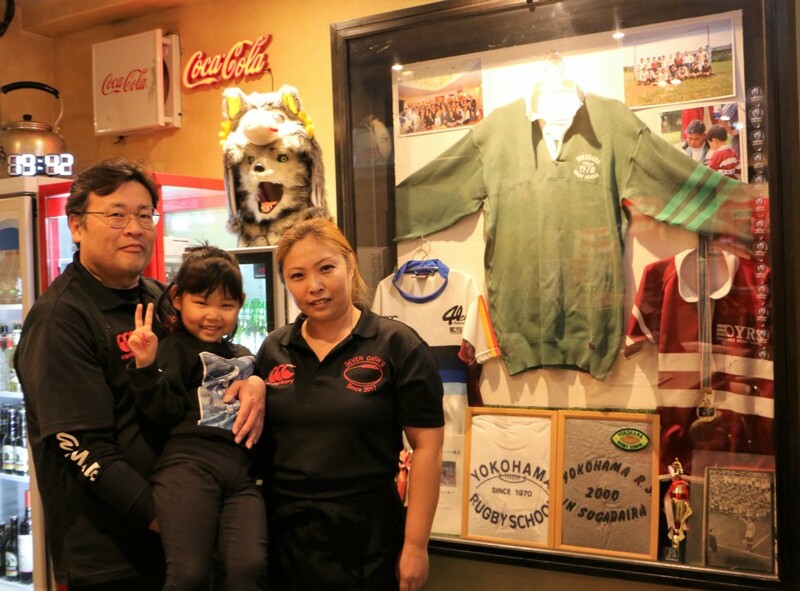 When Yokohama hosted the Bledisloe Cup rugby international between Australia and New Zealand last October, many Aussies stopped by to enjoy the relaxed atmosphere, said Takeshi, surrounded in his restaurant by many teams' shirts. These include an autographed one from the Sunwolves, Japan's Super Rugby team. "I will welcome anybody during the World Cup and keep this restaurant open as long as customers stay here," Takeshi said.